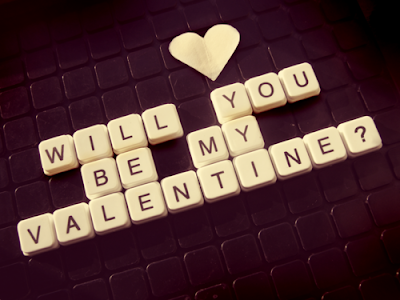 Happy Valentine's Day, my bloggy dears! I wish you all a day of indulgence, be it with a partner, a friend or your awesome selves! Joe and I are celebrating in a low-key fashion. He has to work, so we're just going to grab a late dinner at our favorite Italian restaurant and share a few drinks. While we were at a store yesterday, Joe grabbed my purse strap and whipped me into the next aisle. It felt very comical, and I expected him to point some fantastic item out to me. Instead, he looked completely serious and said "I just saw someone, and I think you're going to want to leave. Right now!" A mental flipbook of people who I'd rather not run into played out in my head. I looked at him quizzically, and he blurted out the name as he continued pulling me toward the door. He was absolutely right! We made a mad dash to the car as he offered to take me to another store a little further away. As we buckled in, I couldn't help but feel a surge of glee. This guy knows me! Like, really knows me. I couldn't have cared less about the undesirable inside the store at that moment. The only thing that mattered to me was that Joe had acted as an extension of me, and protected me from an unpleasant situation. Talk about a knight in shining armor! In great adoration and thankfulness, I then treated him to a butter and sugar crepe! Aww what a great guy! Your stories always bring a smile to my face :) Hope you two have a very happy Valentines day! Hahaha when I started reading this I thought it was going to go towards the hot and heavy in public...not rushing out! Too funny. love this post!! so sweet.